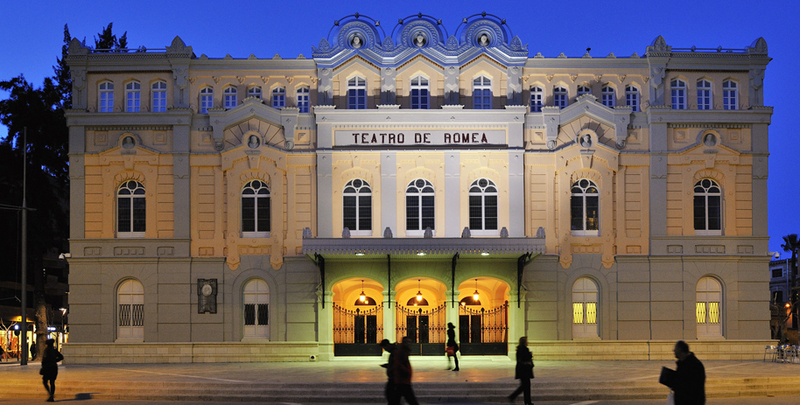 On the 9th of March the Teatro Romea in the city of Murcia will once again open its doors after having been closed for several years. This real architectural beauty, built in 1962 in neo-classical style, is characterised by a wonderful façade in an eclectic style that includes modernist details such as the theatre awning, and the cast iron grilles that decorate the entrance alongside the busts of Beethoven, Mozart and Listz. To celebrate the inauguration of this new period, the theatre has chosen Etcétera Teatro’s excellent version of the opera “El Retablo de Maese Pedro” (Master Peter’s Puppet Show) by Manuel de Falla, directed by Enrique Lanz. This opera, which was performed for the first time in the Gran Teatre del Liceu in Barcelona, is undeniably one of Etcetera’s great achievements; it was also the opera with which Enrique Lanz gained the first prize for stage direction awarded by the Barcelona Critics Association. 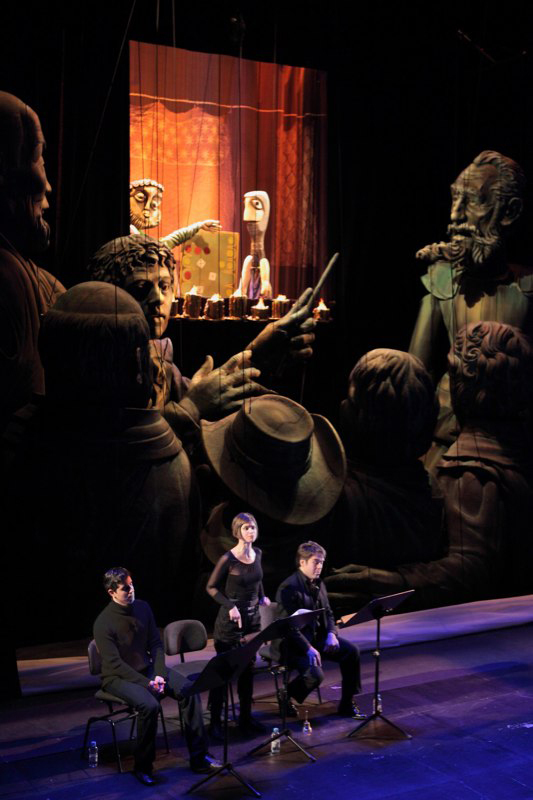 The Retablo has been performed in practically every Spanish opera house, as well as in a number of European theatres – among them the legendary La Monnaie in Brussels -, winning high praise from both adults and children. The Retablo de Maese Pedro is one of the greatest challenges that this theatre company from Granada has faced. This is a company that, from its very beginning, has moved forward leaping from challenge to challenge, since Enrique Lanz is one of those people who enjoy encountering the unknown in each new project. But the Retablo was a colossal challenge not only for the opera itself, which is very difficult to perform because of a tricky libretto with a narrator, the Trujamán, who sings rather than talks, and a tangled plot that sometimes moves forward at great speed. No, the real challenge was the puppets’ size, because from the beginning Lanz wanted them to occupy the entire space of an opera stage. Therefore, they are giant puppets that pose more than a few logistical problems that add to the dramatic ones. The result is simply spectacular and wonderful, and one of the best productions ever created of this opera. 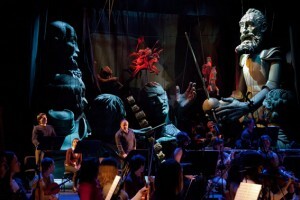 The other challenge Enrique Lanz faced was of a personal and biographical nature, since the person who had made the puppets and scenery with which this opera was performed for the first time, in 1923, was Hermenegildo Lanz, Enrique’s grandfather and a member of the so-called Generation of ’27. Hermenegildo was a great friend of Falla and Lorca, and also made the puppets that the poet, born in Granada, used for his performances of Cristobitas. Being a puppeteer, it was inevitable that Enrique would one day take up the challenge of this opera with which his grandfather had been involved, although he obviously had to discover his own approach to it. Hence his efforts to find a different formal and dramaturgical solution which would be original and, at the same time, ‘grand’ enough to render a sincere and passionate homage to the person who was his life’s mentor. Enrique was supported by a great team and a number of collaborations, among which the invaluable participation of Yanisbel Victoria with the dramaturgical research, and as the person responsible for the complex logistics of the opera’s production. In short, the Teatro Romea in Murcia could not have found a better show for its inauguration. Congratulations from Puppetring.